Some lower-value projects would be also delayed and the cost of the East-West Link would be reduced by adopting an option with a better benefit-to-cost ratio, saving $1.2bn. 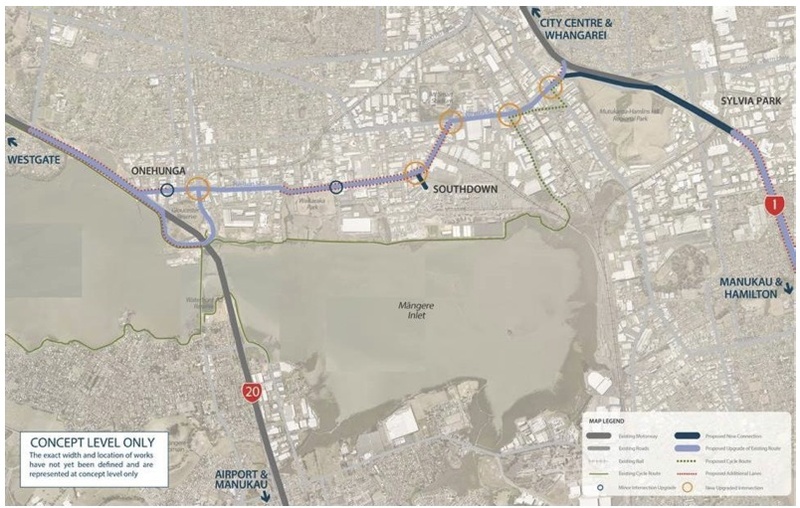 But what’s perhaps been most frustrating about the project from the start is that there are a series of really obvious, much smaller, improvements that could make a world of difference to the transport issues faced in this part of Auckland at a fraction of the cost and a fraction of the impact. This was well highlighted in earlier phases of the project’s business case and its options analysis. Cam took a good look at this back in December 2015. Option F formed the basis of NZTA’s further work in developing the project – even though it cost substantially more than Option B and generated less benefit. This is highly unusual and, as Cam’s post pointed out, completely goes against NZTA guidance on what are known as “incremental BCRs” (the value of further investment over and above a smaller project). Even crazier, as time has gone on the cost of Option F has increased as the challenges of building this route have become clear. This further pushes down the value for money offering of this oversize solution. Up close some careful design and engineering would obviously be required, but it certainly seems feasible that a lane or two each way could be squeezed in along here, potentially even making better use of some of the more under-utilised parts of the Southeastern Highway. 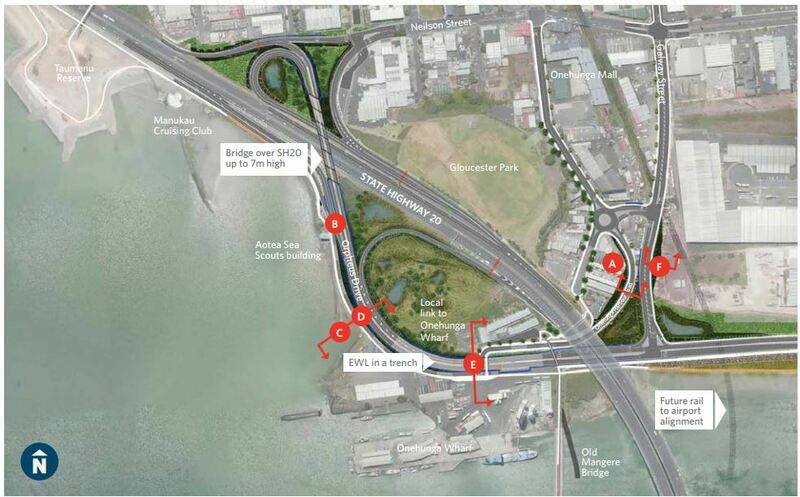 You can tell by looking at some of the earlier work on the East West project that there was a genuine desire from NZTA to investigate in detail some of the smaller scale options. Yet for some reason over time that seemed to be overtaken by a push for the biggest, most expensive option that creates the greatest level of environmental impact. Depending on the outcome of the upcoming election, we may well yet see these ideas re-emerge. From an Onehunga and Auckland point of view, part of this debate needs to be realigned with the urban development of the port node. It’s a very tricky and tight location with many interested. Plus to be honest, abused by past development and treated as a back end. It’s a deep water port on the Manukau to use it purely as a road transport node is crazy. The viewpoint needs to be realigned with seeing it an leverage point for redevelop the Manukau harbour. So “fixing the road” solutions should come after how do we “create places for people”? Yes, people before roads. And even more fundamental than that: how can we expect our civilisation to survive if we keep annihilating our ecological base? The East West Link as being decided by the BOI ruins all chances of regenerating the important coastal ecology in the area, and will induce traffic, increasing carbon emissions and air and water pollution. Especially after Panuku gave us their vision of a developed port/town-centre precinct. There’s so much potential to create a vibrant, active space for all the community. That needs to be remembered for sure. Someone should delete this racist post. Go somewhere else with your crap. The fact is, the comment is some what true. How many rich NZer’s live there? Great post on what should be the obvious option. By the way the Board of Inquiry, which is examining Option F, is still ongoing. The Hearing is not scheduled to finish until 15 September and it will be a couple of months before the decision is announced. I’ll do an update post on this shortly. Option B is far better than F, but intersection and road upgrades still result in reduced pedestrian amenity and cyclist safety, and increased traffic and car dependency. With the CFN2, could sufficient traffic not be removed from the existing roading onto PT and rail to avoid the need for road upgrades? Not sure about reduced ped amenity in this case. Have you tried walking between Church St and Edinburgh St on the Sth side of Neilson currently? Or crossing Neilson between Church and Capt Springs? I agree the pedestrian amenity is not good. Is there sufficient detail available on option B to see if things would improve for pedestrians at those widened intersections and upgraded roads? Well if the ‘Major Intersection’ indicated in Option 2 of the business case (= Option B above) for access to Southdown (Metroport, Kiwirail and currently Toll) from Neilson means traffic lights usable by pedestrians, that would be an improvement. The current 3 closely-spaced driveways of 2, 4, and 2 lane widths are a horror. * When they ripped out the old rail bridge they should have included a dedicated extra left turn lane from Neilson into Onehunga Mall towards motorway. That would allow 2 dedicated straight ahead lanes. * Close Glousestor Park road removing one set of totally unnecessary lights. West bound towards the port and onto the northbound ramp? Maybe, problem is that this traffic would still sit at the ramp lights onto the motorway. This is actually one reason why I think the whole design is useless. The outbound capacity of the bridge in either direction is not increasing. This is something of a non sequiter but relevant to (bad) road planning. I think AT may have just set a world record for induced demand. I write from Auckland airport, having spent 75 minutes by Skybus getting from Queen Street to the terminal. Skybus was not the problem. 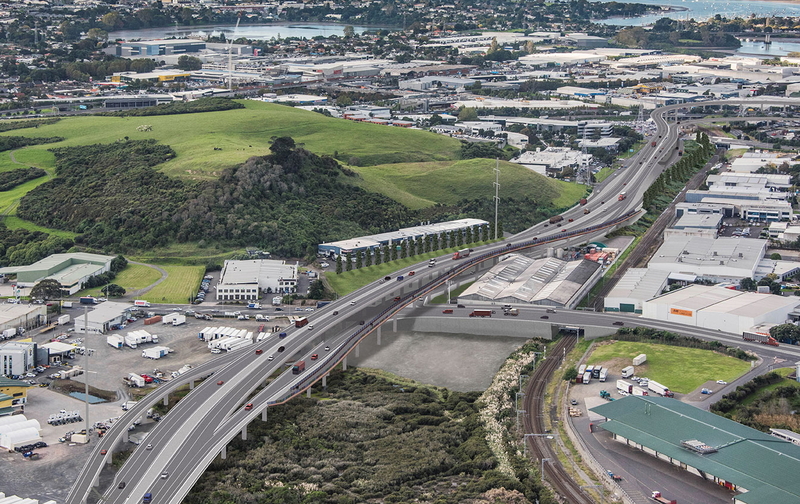 The Kirkbride Road interchange is now almost finished and traffic can use the new “free flow” underpass on SH20A. Problem was, before you even exit the underpass you reqch the end of a queue extending right back from the airport access roundabout. Travel time from there to the airport? Less than 15kmhr. Travel time “saving” from the interchange? Nil! Economic benefit? Nil! Two weeks after “opening”! All this interchange has done is move the queue a few km down the road. Seriiously, what was the point of opening up the middle lanes when the chokepoint of the airport roundabout remained? Was this a political stunt? If yes, I doubt it has won many votes. Nothing to do with AT, it’s an NZTA state highway. Sorry you are quite right, it was AT not NZTA for this one. Indeed it was the NZTA. IIRC the Kirkbride Road interchange project cost around $150 million, and as you say all it has done is move the bottleneck. This is what was predicted on the Transport Blog at the time, and yet the NZTA, backed by their political masters, went ahead with this terrible waste of money. Aucklanders are crying out for better public transport, and yet this is how our tax dollars have been wasted. Remember that – and remind those around you to remember that – when you vote on September 23. Yes, traffic’s building, but it’s in specific places, and at specific times. A Remuera family learning violin from my children’s teacher in Pt Chev wouldn’t change lesson time a few weeks ago because the SH16 takes too long now at whatever time of day they were discussing… with people now using it to go south, the family find it takes too long to come to Pt Chev. And in the dead end streets of Pt Chev, people are using their cars at peak hour to pop out to things they wouldn’t have bothered to do before… so there’s more traffic when the kids are out playing. Was just talking to my mother and brother in the same jam. Laughable. 20,000 people work around the airport. They are development a new industrial zone, which will add more people. Plus we have people who travel there for whatever reason outside the airport – couriers, sales people, people picking up parcels, etc. That’s a lot of time in cars because there are no PT options. Agreed Nicholas, it is a lot of time in cars as their is no choice. In other words, we have been given no choice but to waste our time. Put another way, National poured IIRC $150 million into the road and just shifted the congestion. Labour and the Greens want to build light rail to the airport pronto to give people working at/near or travelling from the airport transport choice and a way to avoid the congestion. The contrast this election is brutally stark. Regardless, I’m still hoping that the BOI will reject it. Speaking on Wednesday. Hopefully my points will be another feather on the right side of the scale. Thanks for appearing at the BOI Nicholas. Best of luck and all power to you! Well said Glen. It’s endemic – cars are pouring into Auckland from North, South, East and West. Light rail is needed in a lot more places than just to the airport. Even our good mayor drives to work for goodness sake! What is so disheartening is all that we see from AT is plans for more and more roads unless you live in one or two select locations. Big changes are needed at AT and the recent changes to their board seem to have made no difference at all. Indeed. Labour’s policy is to significantly scale this monstrosity back. IIRC the Greens want to cancel it outright and investigate PT and walking/cycling alternatives (the broader area suffers from bad motorway severance). Unfortunately I think the left vote will be split meaning Denise Lee gets in, not that it has much impact on the make up of parliament with MMP. I’d hoped Chloe would have enough of a profile to be able to seriously challenge Denise, but it seems she’s been busy campaigning nationally to rebuild the party vote. Understandable after Metiria’s ousting, but unfortunate for our electorate. As you say, the left will be split, letting Lee in. I’m a little confused – Why does the road have to link the two motorways at all? I was under the impression that most of the trucks would have been heading south which, if true, would make linking to SH20 a pretty pork barrel decision. Mind you, the government and NZTA were probably thinking “its only Onehunga, that’s practically Mangere Bridge!” – A sad and unenlightened way to think. Any major roading upgrade through Onehunga will do a lot of damage to an interesting and fast changing part of our city. Onehunga has so much potential, but is at so much risk to road madness due to it’s location and history. 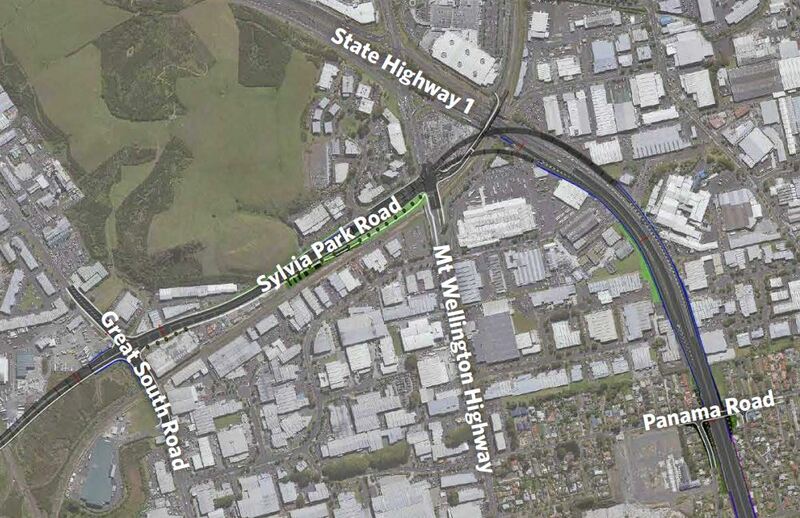 Those two red lines on the last map would make an amazing cost effective difference to the current situation, and stop the hour-long grind along Great South Road and Sylivia Park Road, especially for traffic going to and from the Southdown container terminal complex from points to the south – While they are on the job, a set of traffic lights on Neilson Street at the Southdown entrance wouldn’t go astray. I think a lot of correspondents on this site would be gobsmacked at just how much of Auckland’s commerce goes through that place. The driver interactions at the entrance to Metroport/Toll (and adjacent driveways) make me wonder how autonomous vehicles’ logic would deal with the situation. Truckies with in-car beg buttons? Agree, evanj.. the red lines would make a massive difference. Also that the importance of this area is not well understood by many commenters. I’d also support elevating Neilson St from just west of O’Rorke Road to and over GSR to where the motorway ramps are proposed. The East-West link is quickly becoming the poster child for the National Government’s poor transport policy. I used to think nothing would beat Puhoi-Wellsford, but sadly I was proven wrong! And I say this not because I don’t like highways and/or support road investment. I actually wouldn’t mind so much if the National Government had decided to prioritise investment in road infrastructure, and then set about accelerating previously unfunded projects. There are many potential road investments all over New Zealand that could be accelerated and which would deliver genuine benefits. While I would not necessarily vote for such a policy platform, I would also not be deeply hostile to it. National weren’t content to simply increase funding for these unfunded highways and roads, however, but also wanted to decide what projects got funded. Ironically they engaged in the very thing that they criticise left-wing parties for: “Picking winners”. In their desparate desire for political attention, National have given us projects like the East-West link and Puhoi-Wellsford. Taken together, they’ve probably spent $5 billion on highway projects that really aren’t going to deliver much bang for a lot of buck. It’s sad because many of these locations are deserving of significant road investment, just not of the type and scale proposed by National. As the post notes, there is an urgent need and opportunity to improve transport outcomes in the Onehunga/Penrose area. But we can do that without spending $2 billion dollars. Joyce has Muldoon tendencies and he is tying himself into the same sort of knots. Too many decisions made for political reasons, too few business cases, an overall economic model full of cognitive dissonance…..
Pls cancel the EW link and do the lane squeezing. 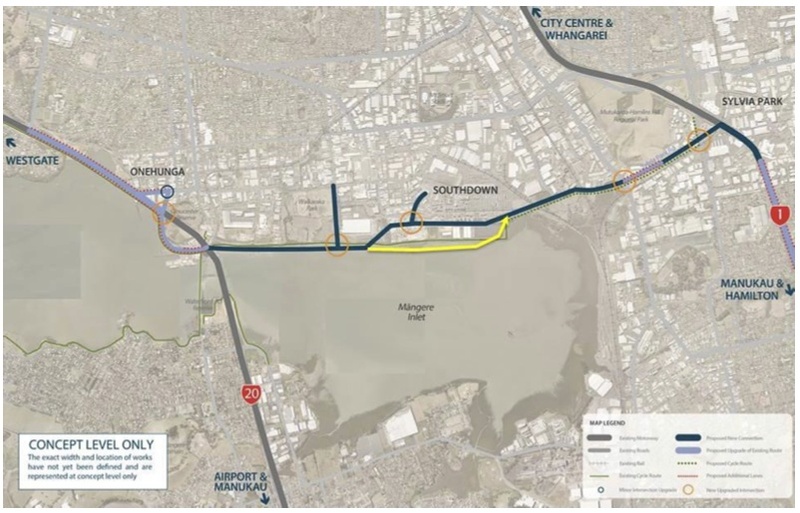 The Highways at Hillsborough, Papakura, St Mary’s Bay, Spaghetti junction, Western Springs and the planed E W link cut a very wide 100 meters path through precious land and divide communities. To people in the NZTA they may be attractive and desirable. But Auckland is better with rail and PT making it better for commuters and less congestion for the business people. As announced at the CBT Transport Debate New Zealand First is the only party opposing the East-West link. Some improvements to the current road are needed, but NO EAST WEST LINK with New Zealand First. I’m pretty sure the Greens oppose it as well. And Labour, their plan to scale it right back amounts to some improvements to existing roads. It the 90km/hr heavy truck speed limit was enforced on the southern motorway then any time advantage of building the east-west link could be quickly eliminated. Being tailgated on the southern motorway by obviously heavily loaded B-trains doing over 100km/hr is bloody scary. Sift the containers by train. Metroport is the rail head for Tuaranga. Auckland has an inland container port in Wiri. It’s not very efficient though, I’m told most of our containers to my site in Wiri still come from town. Or alternatively some shipping schedules when they show Auckland that actually mean Tuaranga then MetroPort. I’m not sure if Tuaranga Port could shift volume to the Wiri port for FCL’s bound to southern areas and the airport. That maybe something that should be ask in the context of the EWL. Also hopefully a third/fourth main will mean better operational efficiency for containers coming out of Auckland Port to Wiri. Maybe ask Ports of Auckland for their Business Plan for their Wiri Inland Port. It’s hard to understand why customers will pay for extra moves. This how it works at the moment with Ports of Auckland. They have a booking system, but trucks still need to queue before being loaded. Since trucks with swing lifts are more expensive that trucks without swing lifts. Our trucking company uses trucks without swing lifts to collect from the port and then cross-loads the containers in the street outside our warehouse before doing the container drop. Also, If the port could move 1000+ FCLs to Wiri and have trucks collect from there it would reduce travel time. That is a 1000 less truck travelling between the CBD and near or south of Wiri. Likely that there are operational issues (third main?) that prevent this from happening. Also I’m not sure how big the sidings in Wiri compared to Metroport. So the Tuaranga port might be able to handle more volume per train slot on the network. Second, Auckland Port may see no incentive to themselves right now to increase efficiency at their water port in order to provide service at their land port. They might just be holding it as a future option. I doubt they’d tell us. Now if we got Auckland Council and the Government to act and get an optimal solution then it might work. If the problem is improving access and efficiency for freight movements, wouldn’t a road based solution need to include Freight only lanes? At least this will ensure that the investment is actually used by the sector for who it is intended. Otherwise Freight will queue behind SOV’s like it does everywhere else. I think the Wiri sidings are a lot shorter than the Metroport sidings, and there is a lot fewer of them. The Metroport sidings at Southdown include just two tracks, one for the train and a loop for the loco to run around. As soon as a train arrives it is pounced on by top lifters, which lift the inbound containers off the wagons and replace them with out-bound containers. In less than three hours that train is heading back south and another in-bound train is taking its place – it is a really slick operation There are no actual storage sidings for Metroport at Southdown. KiwiRail and Toll’s operations are separate. When discussing Southdown, don’t forget a fourth operator, Metrobox. TOES put together some more honest versions of the pictures NZTA released.